Why tomato juice and other home remedies are believed to eliminate skunk odor. Bathing an animal in tomato juice seems to work because at high doses of skunk spray the human nose quits smelling the odor (olfactory fatigue). When this happens, the odor of tomato juice can easily be detected. A person suffering olfactory fatigue to skunk spray will swear that the skunk odor is gone and was neutralized by the tomato juice. Another person coming on the scene at this point will readily confirm that the skunk spray has not been neutralized by the tomato juice. 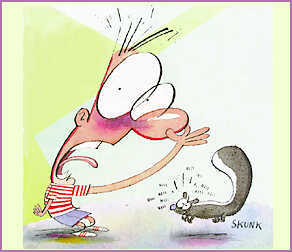 To get rid of the odor of skunk spray, it is necessary to change the thiols into compounds that have little or no odor. This can easily be done by oxidizing the thiols to sulfonic acids. Many oxidizing agents can effect this change. For inanimate objects, sodium hypochlorite solutions (liquid laundry bleach) are cheap and effective, but can't be used on pets because they are caustic. The chemical reaction for this transformation follows. References: "New Components in Defensive Secretion of the Striped Skunk, Mephitis mephitis." William F. Wood, J. Chemical Ecology 16, 2057-2065 (1990). "Some chemical constituents of the scent of the striped skunk (Mephitis mephitis)." Andersen, K. K., and Bernstein, D. T. J. Chemical Ecology 1, 493-499 (1975).